Welcome to day two of kid friendly food week. My two year old nephew loves sloppy joe meat over baked potatoes. He’ll eat every last bite, skin included, of it. This would be excellent served with a green salad and some fruit. 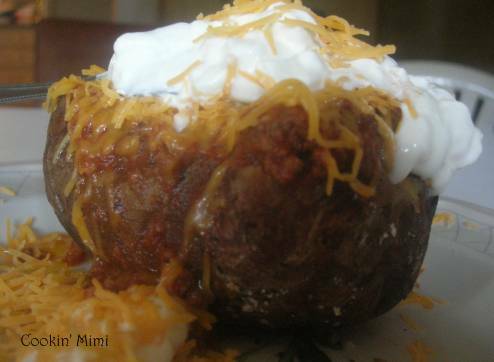 baked potato toppers such as cheese and sour cream. Scrub and prick the potatoes with a fork in several places. Wrap in foil and bake in a 425 degree oven for about an hour or until cooked through. It really depends on how large your potatoes are on how long to cook them. Prepare your favorite sloppy joe recipe and if needed put in a slow cooker on warm to keep hot. When the potatoes are done slit open and top with your meat and favorite potato toppers.